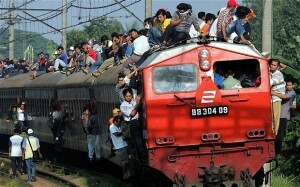 Indonesian passengers choose to ride on the roof tops to escape the overcrowding in the train cars, particularly during rush-hour. Mateta Rizahulhaq, spokesman for Indonesia’s state-run railroad. The company is implementing a new scare tactic to discourage passengers from riding on the roofs of trains: suspending concrete balls the size of grapefruits that dangle just above the height of the train cars. Train chiefs have tried many tactics to prevent people from riding on top of the train cars: spraying the roof riders with red paint, threatened them with dogs, put barbed wire on top of carriages and even sought the help of Muslim religious leaders to halt the deadly practice, all to no avail. Mulyanto, 27, who travels from Bogor to Jakarta each day, thinks he will keep pushing his luck. “I think it could be really dangerous. But I don’t think it’ll last long. They’ve tried everything to keep us from riding … in the end we always win. We like it up there. It’s windy, really nice,” he said. Workers install a frame with concrete balls suspended on it above railway West Java, Indonesia.